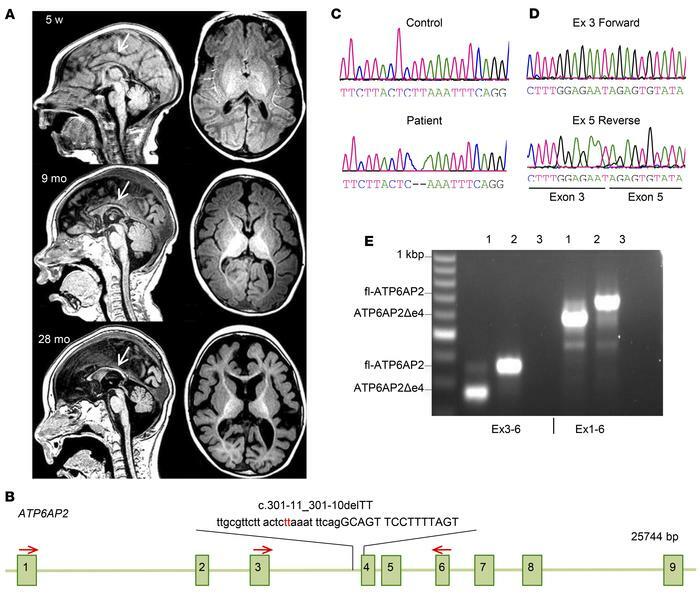 Fulminant neurodegeneration in patient carrying ATP6AP2 (c.301-11_301-10delTT) variant. (A) Sequential brain MRI of patient 1 carrying the ATP6AP2 (c.301-11_301-10delTT) variant at 5 weeks, 9 months, and 28 months of age. Sagittal (left) and axial (right) T1-weighted MR images at 5 weeks showed a thin, poorly developing corpus callosum (arrow) and diffuse volume loss of the brain parenchyma, enlarged ventricles, and prominent sulci. At 9 months the MRI revealed delayed myelination, a persistently thin hypoplastic corpus callosum (arrow), and parenchymal volume loss. At 28 months the MRI showed a markedly thin corpus callosum (arrow), minimal myelination throughout the brain, and significant parenchymal gray and white matter volume losses. (B) ATP6AP2 genomic organization and position of c.301-11_301-10delTT variant. Red arrows: primers used for RT-PCR. (C) Chromatogram of genomic DNA sequencing shows TT deletion in ATP6AP2 in the affected individual. (D) Chromatogram of cDNA sequencing shows exon 4 deletion. (E) RT-PCR analysis of patient fibroblast with fl-ATP6AP2 and a shorter product representing approximately 80% of ATP6AP2 transcripts. Lane 1, patient; lane 2, control; lane 3, H2O.